Along the coastline, ocean waves and currents naturally carry sand from place to place. At any given time, one beach may be losing sand, while another may be gaining sand. Although the continual movement of sand is a natural and important process in the coastal ecosystem, it poses a management challenge. Erosion of sand can put shoreline buildings and infrastructure at risk of damage, and shrinkage or loss of swimming beaches can cause a decline in tourism revenues. One common management response to coastal erosion is to bring sand from another location and use it to replace the lost sand. This approach, known as beach nourishment, often uses sand mined from the outer continental shelf. An area from which sand is removed is called a borrow site. Because of increasing rates of erosion associated with sea level rise and intensifying coastal storms with climate change, demand for sand from offshore borrow sites to use in beach nourishment projects is expected to rise. Large areas of sand ridges and troughs characterize the continental shelf of this region. Two hundred and forty-five sand ridges have been identified from Long Island to North Carolina (Normandeau Associates, Inc. 2014 and references therein). These sand ridges are generally over 1000 m long, 1 to 4 km wide with wavelengths of 1 to 11 km, with reliefs up to 12 m (Normandeau Associates, Inc. 2014 and references therein). Much is still unknown about natural processes for offshore and onshore transport of sand. 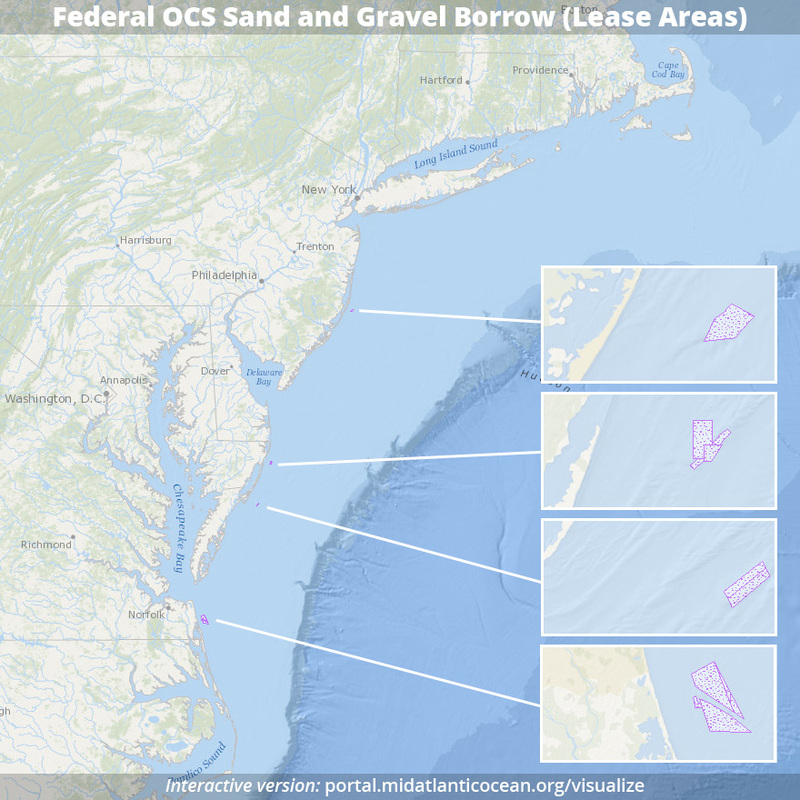 The Mid-Atlantic Ocean Data Portal has identified a need for more geospatial data on sand, gravel, and cobble mining, including areas where resources are actively mined from the seafloor and potential source areas. Currently, detailed information is available for Maryland only, and work continues to develop a regional-scale map layer using state and federal sources. Research is also needed on the impacts to habitats and wildlife of sand movement or mining. For interactive map, go to MARCO Data Portal and click on Maritime > Federal OCS Sand and Gravel Borrow (Lease Areas).